She was born on October 29, 1918 to Ralph and Nora (Bex) Connerly in Lawrence County, IN. Mae worked as a Assembler for Magnavox. She was preceded in death by her parents; Ralph E. and Nora Connerly, her husband, Basil Walters and her sisters; Agnes White and Berniece Robinson. Mae is survived by her loving family; daughter, Lauretta L. Smith of Saint Cloud, FL; grandsons, Daniel (Beth) Evans of NC, Timothy Evans of WA; granddaughter, Deanna (Rick) Felblinger of St. Cloud, FL; great-grandsons, Zyn Yarborough, III, Shane (Heather) Yarborough and J.D. Yarborough all of St. Cloud, FL, John Basil Evans of WA. The family will receive friends on Monday, January 14, 2019 from five o'clock to seven o'clock pm, followed by a funeral service at seven o'clock pm with Pastor Jay Avant officiating. All will take place in the funeral home chapel. 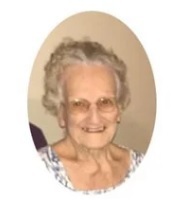 Mrs. Walters is being sent to Fremont, Indiana for services and burial.